As part of a Research Experiences for Teachers program at Notre Dame this summer, we assisted a couple of high school teachers (Phil Cook and Alexa Kutch) in building a Rostock Max printer. Phil has documented this on his blog. Lexi will be using the printer in her high school math class (New Prairie HS) this year. She developed 10 curriculum lesson plans that will be used in her geometry class this year. Phil shot this video of an early ceramic print. I hope to be able to follow up with Lexi’s experiences with using the printer in her high school class later in the Fall. Sophisticated versions of this concept are used widely in industry, but their cost is 2-3x that of the printer itself. Instead we utilize the poor man’s approach to auger based dispensing. The TS5000DMP sold by OK International is shown below along with a partially disassembled unit . The “DMP” in the name stands for “disposable material path” and that is what the three plastic assemblies are in the picture below. They are 3 different Auger screw sizes that can be used in the TS5000. They are relatively inexpensive ($25 each), so they are disposable in the view of microelectronics manufacturers but not for starving artists. The plastic parts of the DMP are intended for extruding polymers, and not hard and abrasive ceramics. Finely ground slip systems will help to extend useable lifetimes, but the plastic DMP will wear out over time and need to be replaced. Unfortunately, auger components compatible with ceramics cost thousands of dollars (e.g. see ceramic augers here ). 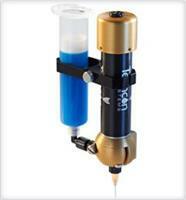 The key to adapting the expensive auger technology for inexpensive ceramic printing is the plastic DMP unit. 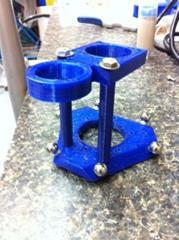 A primary component of the slurry adapter is a housing to support the DMP unit. This is available at thingiverse as designed by Dries Verbruggen (below, top ), with a version we printed also shown (below, bottom). The other needed component is the auger drive/stepper motor adapter (also available as part of thing:28018) to connect the stepper shaft to the square drive cutout on the auger. We ordered all the syringe parts from OK International. They are the only place with the DMP assembly, so we bought everything else from them at the same time. There are cheaper places for items 2-4, and you don’t need 50 syringes, but we kept things simple since we had to get the DMP from OK International. 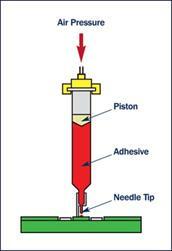 Items 5-7 are various tips to control the extruded diameter. We bought a variety for experimentation. Again, one can save money by being more selective. The total for the above was $440.56. Cost could be reduced by going with cheaper sources for all but the DMP. A separate stepper motor was purchased for use in the slurry extruder ( Nema 17 (part 25253-01) motor for $16.94 from inventables.com). It did not have a flat on the shaft, so we ground one to match the coupler. It also lacked electrical connectors so we made a cable to connect the stepper with the Rambo control board used by the Rostock Max. The effector plate design (below, top) was slightly modified by adding a couple of holes towards one corner for the ceramic extruder assembly mount. We went old school for this and just drilled in a couple of holes after sizing the layout. The picture (below, bottom) shows the motor and syringe mount attached to the effector via the standoffs. The purpose of the mount standoffs is to minimize any reduction of the print radius that might result if the extruder assembly collided with the arms. With this location and standoff height we can keep the extrusion nozzle near the center (displaced slightly from the center location of the plastic extruder) and not affect the printer radius. With the magnetic effector mounts, it is easy to pop the plastic extruder assembly off and replace it with the ceramic unit. 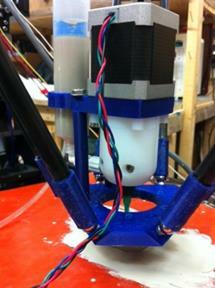 When this is done the extruder-appropriate firmware (plastic or ceramic) also needs to be loaded. 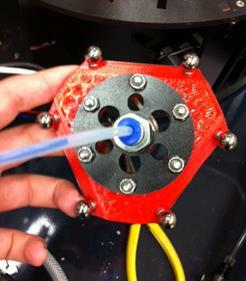 The only modifications to the extruder from the Unfold design are the vertical standoffs and the plate with holes (one round, one square) to fix the syringe to the stepper as the proper distance for the DMP auger assembly. 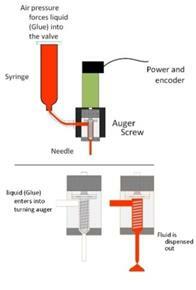 During printing operation, syringes can be replaced by just twisting off of the Luer lock on the DMP auger. The assembled unit is shown in the pictures below. 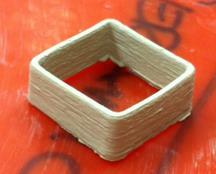 Some initial prints using the ceramic extruder are shown below. The red print surface is a piece of vinyl (the backside of a ceramist’s vinyl texture mat) that is placed over the glass and heated bed. Hence the print surface height for ceramics is slightly different that for plastics. An 18 gauge needle (Tech-con 918025-TE ) with a 0.84 mm ID was used with a layer height of 0.5 mm. These parameters and the slip consistency/viscosity have yet to be optimized. The extruder functions nicely but it is slow. 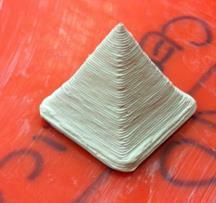 To print large objects larger volumes of clay need to be extruded at a faster rate. One means of increasing the rate is to change the stepper motor. The motor presently being used is a typical 1.8o/step; 200 steps/revolution unit. To increase this by a factor of 2 we ordered a lower resolution, higher speed stepper motor. We located the Wantai 39BYGS202 (3.75o/step; 96 steps/revolution) at Green Energy Research for $17.55. The same motor is also available from Phidgets. Selecting a 6-pitch auger rather than the 8-pitch would also speed up delivery rate. Neither of these steps will lead to the kind of rate we think is needed. Before we admit defeat and go augerless and rely only on air pressure, we will take a shot at building an extruder based on a drill bit. This concept is widely used for filament extruders (e.g. thing 83570 and thing:34653). 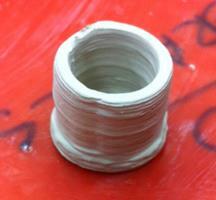 An attempt at making a paste extruder has also been reported by a group at Bauhaus University Weimar. It is not clear if they ultimately had success by this route. Initially we will base our design on a ¼ bit and a brass compression tube fitting right angle run tee. We will post an update as we progress. Initially we chose to use the Bits from Bytes (BfB) RapMan 3.2 3D Printer as our platform since a) it is a wide open design that is easily modified for syringe incorporation and b) because others have already successfully modified this same machine for slurries. 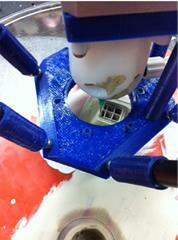 We encountered electronic issues when adding our stepper motor for the clay extruder. These problems could have been solved, but after we purchased our machine BfB was bought out by 3D Systems, and support for the machine waned. While unfortunate, it prompted us to find what is likely a better route, using a delta printer kit (Rostock Max) sold by SeeMeCNC . This was perfect for us as SeeMeCNC is based in Goshen, IN, about 20 miles from us. In early June Prof. McGinn drove over, met Steve Wygant and John Olafson, got a quick tour, and returned to campus with a Rostock Max. The Rostock Max arrives as a kit. This delta design is based on the Rostock developed by Johann Rocholl. After assembly, lots of calibration, and much printing of miscellaneous plastic items (calibration cubes, Yoda, squirrels, etc. ) 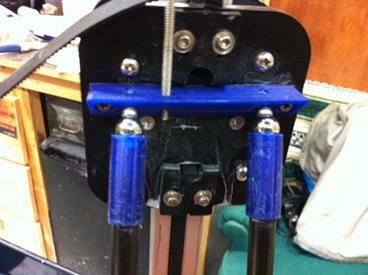 we modified the printer with the Xnaron carbon arms and magnetic bearings as described here and here: As shown in the figures below, the NdFeB magnets in the carbon arms (held in place inside the blue arm caps (below left) allow for free rotation on the steel bearings. The red effector (below right) has 6 bearings that are contacted by the carbon arms when assembled. The magnetic arm modification led to an improvement of our plastic print quality and also allows for a fast change over from printing plastic to ceramic. Jonathon Keep. He has an extensive blog that includes a description of printing using powder support. He beat us to the punch on printing from a delta printer as he had a delta machine up and running in early June (video). A few more details of his delta robot appear in a thread in a delta forum. Rod Bamford. He is an artist from Australia who has also closely followed the work of Dries Verbruggen. He has had several shows and exhibits featuring is “hyperclay” work. You can read about it here and here. His work is featured in the Feb., 2013 issue of Ceramics monthly. 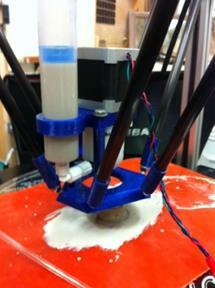 Another Australian, Graham Hay, is also developing a 3D slurry printer for artistic applications. He blogs about it here. He is using a Moineau pump based paste extruder. He is hoping to use paperclay printing, a material that is explained here and here. Other efforts in various stages of development include a group at Bauhaus-Universität Weimar. Ioan Festeu from Romania has developed a paste extruder. He has links to movies showing the extruder in action on the Thingverse page. Another individual who goes by the handle ixelr8 has several videos showing printing with clay on his youtube channel. Eran Gal-or at Holon Institute of Technology (Israel) has built a large (industrial size) printer and has a series of videos. FabLab Zuid-Limburg in the Netherlands is also pursuing this. They made some modifications to Dries Verbruggen’s design as explained here. FabClay is a project by by Saša Jokić (Serbia), Starsk Lara (Colombia) and Nasim Fashami (Iran), using an old school industrial robot. They have written an extensive text on the project. site. This details the work of a group of schools of Architecture exploring numerous novel digital fabrication routes to make architectural components. 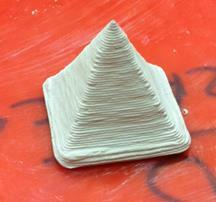 Finally, Adam Holloway at Project Silkworm is pursuing clay printing. In addition to the aforementioned unfold blog, another good resource for general 3D printing ceramic extrusion is at the reprap wiki. While there, also be sure and visit the Powder printer recipes for lots of useful information. One of the issues for 3d printing is selecting appropriate software for generating and processing models. To print an object, a 3D model must first be generated using a CAD program. This model is then exported as an STL file and must be converted to G-code which gives the printer the necessary information to build the object. Mechanical engineering students at ND use an advanced 3D modeling program called Creo. This works well to generate the STL files, but is overly complicated for more simple applications. We tried out Google Sketchup and Art of Illusion which are free and commonly used programs but did not like the user interfaces. We felt a program called Bonzai 3D was much more intuitive and would be easy to learn for people who do not have 3D modeling experience. There is a free version available to students which is very convenient. There are many other programs available and ultimately the choice depends on what your budget is, prior modeling modeling experience, and user interface preferences. 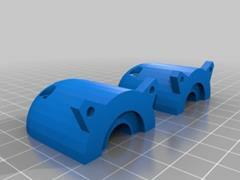 A more comprehensive list of CAD software can be found here. For converting the STL files we selected Slic3r.Again, there are a variety of programs including MeshLab, Skeinforge, Slic3r and others. Skeinforge has many options, but has a complex user interface and is quite slow. 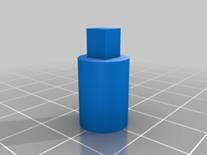 Slic3r can make hollow objects such as vases out of solid objects which simplifies the 3D modeling. A comprehensive list of various programs for converting STL files can be found here.